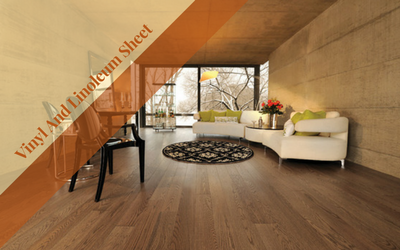 Vinyl and linoleum are the perfect options for those who are looking for economical flooring solutions. Linoleum is top quality in just about every aspect, including hygiene, durability and performance. On the other hand, vinyl is stain and water resistant, and also has great versatility and durability which brings justification to the investment made. Here's a quick breakdown on vinyl and linoleum flooring. One of the main advantages of vinyl and linoleum floors is that they are long lasting and can adapt themselves with almost all designs. If installed properly, they can go a long way with minimum maintenance. In commercial setting, these types of floors are a great choice as they are cheap and also have the ability to take large footfall. But, like other materials, vinyl and linoleum too have certain drawbacks. In hot and humid climates, these natural flooring options can trap moisture within the lining. This provides for dust and dirt buildup. Thus, after a certain period the lining can be detected easily as it turns to thin black line all over the flooring. In such cases, you need to hire a professional cleaning team on a monthly basis. Hiring professionals is worthwhile because they are experts in restoring your adorable flooring, thus making a justification to your investment. The professional cleaners provide a hassle free service with high class performance and user friendly cleaning solutions. The best part is they are not just focused on cleaning vinyl and linoleum floors. They also offer bespoke cleaning services including carpet cleaning, strata cleaning, window cleaning, toilet and bathroom cleaning, all of which are essential for a commercial property. This shows that hiring these commercial cleaners means enhanced cleanliness within your business while establishing a perfect hygienic environment throughout the working area. Even the employees will feel more energetic and be able to handle work pressure efficiently. While it's easy to show interest in going green, from a financial standpoint, most business owners are still curious what’s the cost associated with it. To be honest, you do have to pay a bit more than other products. But, if you look from a green perspective, those higher costs are worth every penny considering the perks in the long run. Therefore, it is best to go for vinyl and linoleum flooring for a commercial space. But then, you must hire professional cleaners for your green flooring in order to maintain its durability. If you liked this post, then stay connected to our blog space for more interesting updates.